Bill is having an unusually ordinary summer until his home run in a softball game jeopardizes Circus's life. - Publisher An innocent game of softball in Bill Collins's barnyard nearly turns fatal. Bill's little sister Charlotte Ann follows him too close to the beehives. Can he or his friend Circus save her from the angry bees? Come along with the Sugar Creek Gang as they learn the importance of honoring our father and mother. Recommended for ages 9 to 12. What kind of trouble can Bill Collins get into when he's spending the afternoon babysitting his little sister, Charlotte Ann' Plenty! The Gang find themselves in the middle of a war between two of the beehives in Mr. Collins' honey bee yard. A note from Old Man Paddler challenges the Sugar Creek Gang with a riddle that reveals more than they bargained for as they uncover a trespassing boy up at his cabin in the woods. Join the Sugar Creek Gang as they learn a few lessons about loving as Jesus does. About "Battle of the Bees (#33 in Sugar Creek Gang Series)"
An innocent game of softball in Bill Collins's barnyard nearly turns fatal. Bill's little sister Charlotte Ann follows him too close to the beehives. 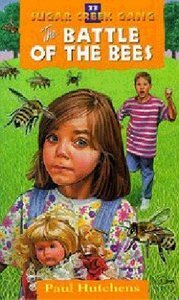 Can he or his friend Circus save her from the angry bees? Come along with the Sugar Creek Gang as they learn the importance of honoring our father and mother. Recommended for ages 9 to 12.